Fly fishing was de rigueur for my Dad. In Oregon, he would fish from after breakfast until shortly before dinner. After dinner, he would usually put on his heavy waders and come trudging back as darkness fell. He would do this virtually every day of our one month summer vacation from the end of July until right after Labor Day. His preparations, though, would begin toward the beginning of July. Then, he would take out his fly tying equipment and begin making flies for the trip. I remember seeing flies shining in his den with many different colors. He was quite an expert at creating flies, and usually had an abundance of them ready to be dropped into the water for trout, and, most importantly, summer steelhead, which he loved to barbecue or put into the freezer for future eating. Dad learned about the art of fly fishing from the chauffeur at Rogue’s Roost, Joseph Chevigny and river guides Glen Wooldridge and Bob Pritchett. The latter initiated him into the art of boating, and locating steelhead holes on the Rogue River. From an early age, Dad could find steelhead water and navigate a navy surplus raft. Dad always enjoyed fishing the Upper Rogue. He tried to teach me how to fish, but trout was all I could manage, and, besides, I didn’t want to pull fish hooks out of my ear, which happened almost every summer with Dad! But I did learn to appreciate and love the river and all its natural habitat as well as do some inner tubing and rafting. Swimming across the river was never one of my talents! In the early years, the Rogue River was a pristine mountain river, its color a pristine blue and so clear that you could see trout swimming or salmon spawning. All that changed when the Lost Creek Dam was built in the late 1070s. Because it was an earthenware dam, it increased the amount of silt that floated downstream and the river’s clear beauty disappeared with it. In the years that followed, more and more people used the river, though without the respect early residents had shown. At one point, the river was declared unfit for swimming and a major effort was made to bring it back to its natural state. I’m grateful that I saw the Rogue River in all its splendor. The short videos that follow show my Dad fly fishing on a truly magnificent river. I hope you enjoy them! Fishing map drawn by Ray Minehan. 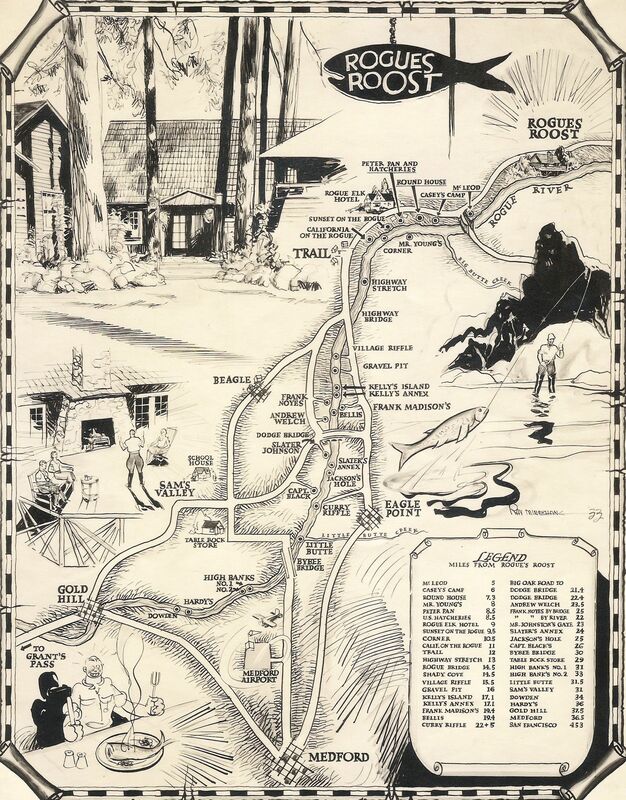 Rogue’s Roost and many other spots on the Rogue River were known for excellent steelhead and salmon, so to provide their guests with a fishing map, Nion and Phyllis Tucker hired sketch artist, Ray Minehan. He drew a limited amount of sketches that are all numbered. This is #22. It is supposed that the maps were drawn in the late 30s or early 40s. The Roost had been purchased by the Tuckers as a picnic site from Walter and Alice Bowne in the 1930s. At that time, there was only a small cabin and nothing to suggest what would become the magnificent Rogue’s Roost. The Tuckers then bought other parcels from different landowners to complete the finished residence. Joseph Chevigny was the chauffeur and fisherman in residence. He and my Dad used to go fishing together. It was Joe who taught my Dad about the art of fly fishing. The area near the Roost boasted a huge spawning bed and great steelhead fishing. Joe created his own fly that he called the Chevigny fly. My Dad copied it and made numerous flies that he gave to friends. He renamed the fly, The Rogue River Special, and the name stuck. It is still used by fishermen today. The upper left of Ray’s map shows the elegant Roost with its spacious lawn. The main building in the center opened out to a deck over the river. It was not unusual to see jack salmon or steelhead jumping in the sparkling water.The lower left of the map shows the result of a fisherman’s efforts: a large, tasty fish ready to be eaten. A few comments regarding some of the places mentioned on the map: 1. The town of McLeod no longer exists. It was subsumed by the U.S. Army Corps of Engineers as a visitors’ information center for Lost Creek Dam. 2. Casey’s Camp was an extention of the original Casey’s Auto Park. Today it is called Casey State Park. 3. Round House(a stone house) was built by Emmett(Sno-Cat) Tucker(no relation to the Tuckers of Rogues Roost) and eventually became the famous Obstinate J Ranch until it was sold and the name changed. 4. Beagle was a pioneer community that began in 1885 and ended in 1941 when the U.S. Army took it over to establish Camp White. 5. Sunset on the Rogue included a gas station, store for food and fishing, and cabins. It still exists today! 6. California on the Rogue offered a gas station and cabins. The name has been changed, but the buildings remain. I knew the owner during the 60s, Mr. Sullivan. I brought a geode to him from the North Umpqua region and asked him if there could be any crystals inside. He said, “Nah!” When I got to the Obstinate J Ranch, I split the geode and found it full of reddish-brown quartz crystals! 7. Captain Black’s refers to what became Black Oaks. 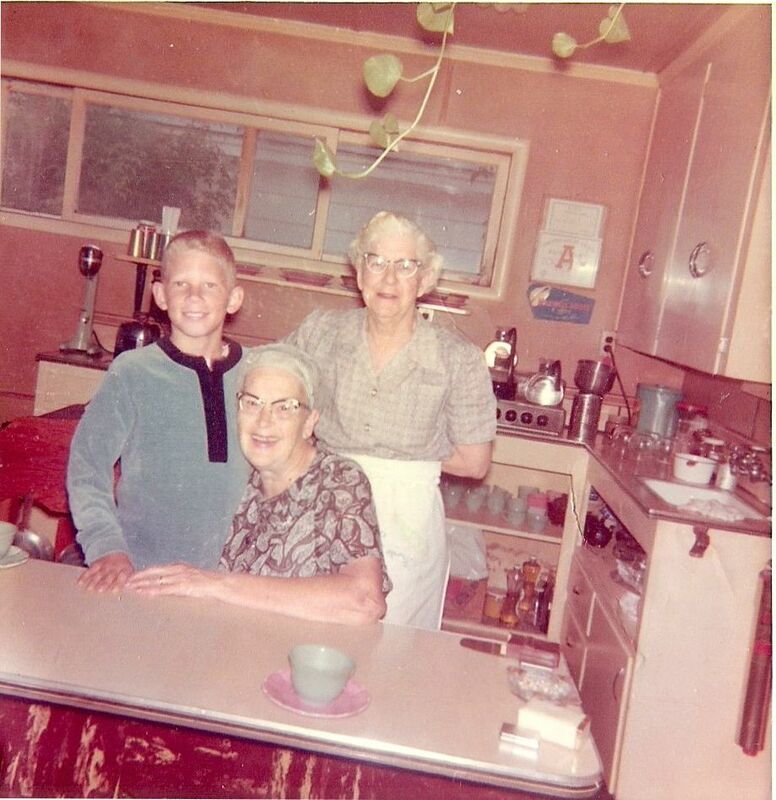 The place currently belongs to the Donald L. Donegan family and encompasses some of the best steelhead water between Dodge Bridge and TouVelle State Park. 8. Dowden and Hardy’s should be reversed. Hardy Rapid Class 2+ contains an enormous hole in the middle of the river that must be avoided. Dowden refers to Dowden Falls, today known as Gold Nugget Falls Class 3+. Every summer rafters and kayakers float the left channel of the falls that includes two large drops, especially the last one! The campground provides a beach with great views of the lower drop. A great place to relax and reflect on nature’s wonders. A long battle for the removal of Savage Rapids Dam ended several years ago when it was finally taken out. The people involved in the job were cautious as to how much water they would let out at any given time and no major incidents occurred. Above it, a placid lake had formed, but there was nothing like the teeming slough in back of Gold Ray. The river at first created a mean rapid, then settled into a more mild Class 2 with just a few rocks to dodge. The river cut a wide swathe where there had once been a more narrow and treacherous drop. It reminded folks of the effects of the 1964 flood, which did precisely the same thing. When the removal of the Gold Ray Dam went from paper to action, the dam removers felt a surge of confidence based on the successful removal of Savage Rapids. But, alas! Hubris and carelessness overtook them. Instead of moving cautiously with measured steps of removal(as had been the case with Savage Rapids), they took large chunks out of the dam, while underestimating the power of the river in back of it. The result was an ecological catastrophe. Suddenly, the river burst through with a violent roar and moved away from the habitat that had depended on it for sustenance. Thousands and thousands of water creatures perished. Photos published showed fishes faces in shock. These pictures brought a truly affecting quality to creatures that were caught and eaten at will. And, irony of ironies, the removal of Gold Ray, which was intended to preserve the salmon and other species, ultimately contributed towards their destruction. It must be said that many people from the Fish and Game tried to save as many species as they could. But their efforts caused only a mild dent in the tragedy that had occurred. Let us hope that in the future, dam removers will show the same consideration for habitat as dam builders. Pearsoney Falls lies just west of Prospect and below the North Fork of the Rogue River Gorge, which plunges over boulders to join the Middle Fork. The falls is reached via an entrance on the south side of Mill Creek Drive. The trail is at the upper end of the parking lot. The falls is the first of many before the spectacular Mill Creek Falls that drops over a cliff to join the two forks of the Rogue River. The video below shows Pearsoney Falls in its grandeur in 2009. Rogue’s Roost: Paradise In The Wilderness, Part 2. “There was a trail down each side of the river, and, at the upper end of the Roost complex, there was a swinging bridge across the river… The bridge was supported by approximately 5/8 inch steel cables, which in turn were supported by large wooden timbers at each end and anchored to large fir trees. The sides of the bridge consisted of wire fencing approximately two 2x12s about two inches apart. A short distance downstream from the bridge were the tennis and croquet courts, then the main lodge. The main lodge included a large kitchen area with a separate dining room for the servants along with two bedrooms and a bath for the Chinese cooks. The main dining room was long and narrow with a fireplace in the middle of one side, built-in buffets on each side of the swinging door into the kitchen, and a very large, long dining table, which was placed down the center of the room. From the dining room, there were steps down into the screen-enclosed “summer” dining room, which was a delightful spot furnished with bright-colored canvas chairs and a rustic handmade table. The screens reached from the eaves to within about two feet of the floor and continued around two sides of the room. Although, Rogue’s Roost no longer exists(it was washed away in the ’64 flood), it left indelible memories. For me, it represents childhood in its most ethereal form. I remember Mom turning our station wagon down the gravel road, which dropped sharply to the river. I can still see the lush vegetation on either side of the road, the narrow bridge crossing the irrigation ditch and the ineffable beauty of the surroundings. I remember the feeling of remoteness and seclusion. And I always felt a sense of awe when we arrived at the entrance. I recall walking on the deck and looking out at the rushing river below. When I looked at all the boulders which stretched across the river, I couldn’t understand how a boat could go through. My clearest memory, though, is walking the path from Rogue’s Roost through a garden to come out on a clearing to the roaring sound of the Rogue River. There was a small beach from where you could watch the river plunge over moss-strewn boulders and pour over a large drop-off amidst a series of huge, volcanic boulders. Rogue’s Roost will always remain a part of my most magical and mysterious childhood memories. And from time to time it beckons, calling me to an untroubled world where the doors to this kingdom open once again, and the river flows by undisturbed.